The first day of tennis’ newest teams competition has finished and what a day of tennis it was. The Laver Cup, named after tennis great Rod Laver, has seen strong but friendly competition on Day 1 with Team Europe taking a 3-1 lead over Team World ahead Day 2. The unique teams format (modeled on golf’s Ryder Cup) sees Europe take on the World. Day 1 saw Europe start strong by winning the first three matches (all singles), which saw all six sets decided by tie-breakers, giving fans excellent value for money. Team World then clawed some momentum back with a crucial doubles win to close out the first day’s play. 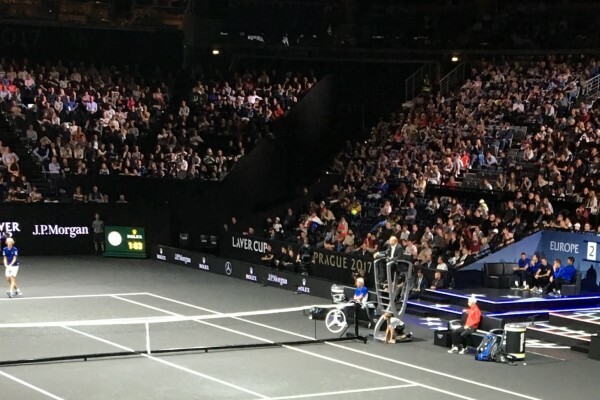 The setting for the first ever Laver Cup is Prague’s O2 Arena, which is about a 10-15 minute drive from central Prague. The rather intimate venue has been delivered clean to Laver Cup organisers which means the venue is covered in Laver Cup branding. Outside fans can spend some time in the fan zone, with food, merchandise and practice court viewing available. There was around a 20 minute queue for merchandise shortly after the end of the afternoon session. Inside the arena fans are treated to a supreme sports viewing experience where it would be surprising if there was a bad seat in the house. 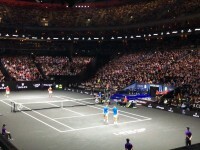 What makes this viewing experience unique is that tournament organisers have opted for a black/charcoal coloured court which is an inspired choice as it is very easy to see the ball from the stands. Further, you can tell that this event has had assistance from Tennis Australia (they part own the event) with the installation of digital signage boards at the ends and on the sides of the court. The stark black and white sponsor logos, interspersed with advertisements from Mercedes Benz when aces are served and Rolex for challenges, makes for a great premium event experience. J.P. Morgan is also a sponsor of this event. The calibre of sponsors evidence the premium nature of this new event. Day 1 of the Laver Cup is now over, but bring on days 2 and 3. If the first day is anything to go by this tournament is here to stay as there is top class tennis from the best players in the world in a serious but fun environment. This is not exhibition tennis, it is the real deal!